This paper proposes a simple and fast method for adapting colour lookup tables to lighting changes in real-time. The method adjusts the classified colour space regions keeping both their surface area and volume constant. 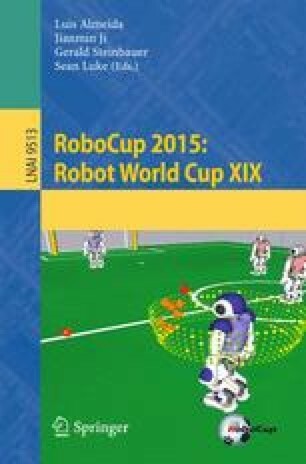 Two variations of the method were compared and tested in a RoboCup soccer setting. Detection success rate was measured as a function of the speed and magnitude of hue change to the lighting environment. Compared to a static lookup table, these experimental results show improved robustness against lighting changes for detection of coloured objects. The authors would like to acknowledge Brendan Annable for early discussions and implementation ideas as well as Ellie-Mae Simpson, Jake Fountain and Amy Kendrick for their assistance in proofreading this document and their helpful suggestions.